Puppets are introduced to us as both inanimate and animate, roughly formed and emotionally expressive, object and subject, entertainers and insurrectionists. Without an audience and the borrowed life force of the puppeteer, they are merely dolls, but through their limited means they are articulate and, when needed to, can act as a mouthpiece for those who do not have this freedom themselves. 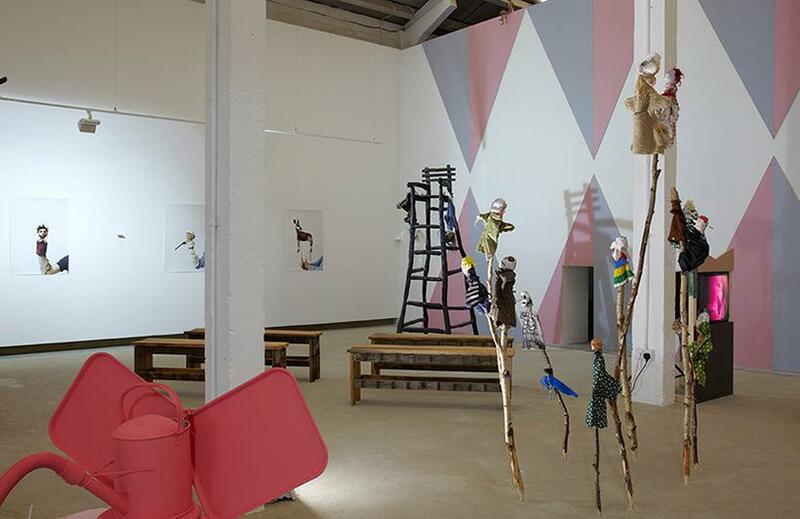 The exhibition design, in sympathy with its puppet protagonists, utilises rudimentary materials, an ad hoc theatricality and a miniaturised scale. A pristine concrete platform, installed for Mike Nelson’s solo show ‘M6’, is now a ‘stage’ that is open to the public to negotiate, with freestanding works, screening room structures and makeshift theatres ranged across it. The furthest wall and backdrop to the gallery has been decked out in a Bauhaus-esque geometric pattern of pink and blue plasterboard. Also here a Lilliputian doorway has been cut straight through to the next room, allowing a puppet-height view back across the exhibition. A historical anchor is the puppet circus performed and developed throughout the career of artist Alexander Calder and documented by filmmaker Jean Painlevé. The child-like joy found in this footage establishes our fundamental urge to see life in objects and project ourselves through them. This playfulness is reflected in new sculptural works by Simon Popper that through the application of colour and pattern to everyday objects creates a small zoo. However, it is with Geoffrey Farmer’s ‘You Know Nothing, The Owl Knows Everything’, that this animism moves towards the personification and the uncanny narratives that this can suggest. The main body of the exhibition leads us through the politically radical potential of the puppet as articulate objects. Jirí Trnka’s ‘The Hand’ (1965) imagines the Czechoslovakian Communist regime transmogrified into a disembodied dictatorial hand. The hand persecutes Trnka’s sculptor for refusing to make a monument in its honour, using seduction, violence and anything else at its disposal to bend the artist’s will. Dan Graham’s contemporary rock opera ‘Don’t Trust Anyone Over Thirty’ (2008) realises a fantasy of a drug-fuelled hippy revolution that never quite happened, a rebellion against uber-conservatism with live soundtrack by noisy anarchists Japanther. Pedro Reyes’ episodic video work ‘Baby Marx’ (2009) similarly stages the impossible; holding a debate between revolutionary figures Karl Marx and Adam Smith in our present, which has been shaped by their ideas. These works explore the talent of puppets to tip the world on its head, to question things as they are and to even enact them as they could be. Puppet theatre dominates the exhibition, although most of the performances exist as video. Pier Paolo Pasolini’s vignette for human marionettes was written and produced for television and speaks vividly through its intended format, while Spartacus Chetwynd’s clearly riotous performing menagerie is muted by its translation and the pyrotechnics of ‘Don’t Trust Anyone’’ feels crammed into the screen. For all the on-screen revolution around them, it is Heather and Ivan Morison’s live puppet shows that most get inside your head. ‘Pleasure Island’ (2008) and its grotesque troupe of characters are performed in the gallery each day. With lumpen heads and rags for bodies they deliver singsong catchphrases that shove taboo about and then drop it like a baby on the floor. This scatological play, without complicated strings or unnecessary articulation, brings us back to the power in the immediacy of saying what a person, with all the limitations of subjectivity, cannot. The relevance of puppets as a subject matter is at its most direct here – as a feeling of growing discontentment with the current political system, and a helplessness when no viable alternatives are available, there is an urgent need to discuss what means exist to protest on societal but also personal levels. The exhibition as a puppet show narrates the historical and contemporary uses of the theatrical radicality of caricature, displaying leftist leanings and a strong antiauthoritarian streak throughout. These qualities are also integral to Eastside Projects’ evolving identity and ‘Puppet Show’ continues one of its most essential processes: questioning how the gallery as an entity can speak to and as part of a public sphere it seeks to construct.